At the base of the Riverwalk's Rotary Hill stands the majestic Millennium Carillon in Moser Tower, a unique, 16-story structure with a 72- bell musical instrument. This gift, given to the Naperville community to commemorate the dawn of the New Millennium, was built through community support and donations, and is maintained through a partnership between the Naperville Park District, Millennium Carillon Foundation and the City of Naperville. The Millennium Carillon project began in late 1997 to permanently commemorate the arrival of the Year 2000. Thanks to a generous $1 million gift from Harold and Margaret Moser, contributions from scores of bell sponsors, private and business donors, countless hours of volunteer efforts, and a generous line of credit in the amount of $1.5 million from the City of Naperville, Phase I was dedicated in June 2000. Then, thanks to a grant of $3.3 million from Naperville's Special Events and Cultural Amenities (SECA) Fund, Moser Tower and the adjacent Visitor Center were opened to the public in July 2007. In recognition of the Millennium Carillon project, Naperville was designated an official White House Millennium Community in 1999. Of the approximately 600 carillons worldwide, Naperville’s is the fourth largest in North America. It is referred to as a “Grand Carillon” because its 72 bells span six octaves and it is one of only a few Grand Carillons in the world. The bells were cast by the Royal Eijsbouts (eyes-bouts) Bell Foundry in The Netherlands and range in weight from ten pounds to nearly six tons with a combined weight of 32.5 tons. The 5.8 ton Captain Joseph Naper Bell (“Big Joe”) is the largest of the bells and strikes the hour daily. The bells can be played in two different ways. Part of the bell system is controlled by a computer located in the cabin and plays automatically at 12:00 p.m., 4:00 p.m., and 7:00 p.m. daily. The large hammers that can be seen fixed near some of the bells are used to sound the bells when the automatic playing system is engaged. A carillonneur also can play the bells manually. 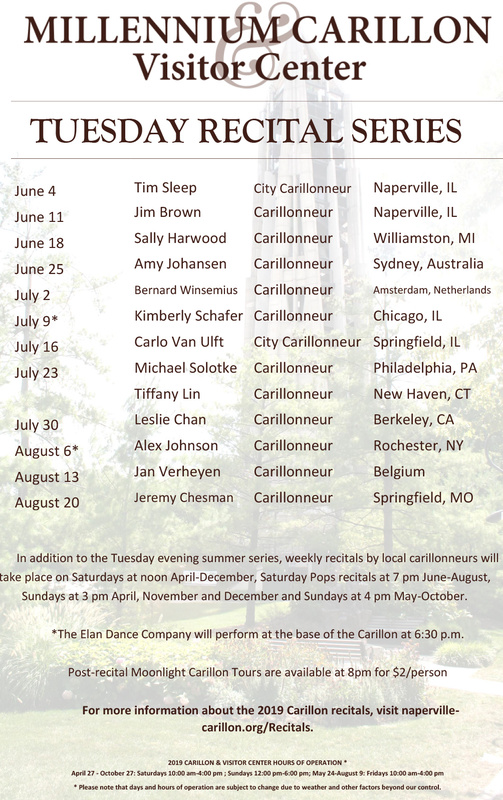 Many local, national, and international carillonneurs perform each summer as part of the Millennium Carillon Summer Recital Series. In addition, recitals are performed each week, all year long. Saturday, August 31 and Sunday, September 1: The Visitor Center and Carillon are closed. Visitor Center admission is free of charge. Carillon tours are $3 for ages 5 and older; children 4 years and under are free. Visitors under 18 years of age must be accompanied by an adult. The Millennium Carillon and Visitor Center are located along the Riverwalk at the base of Rotary Hill at 443 Aurora Ave.
All tours are guided and only done during operational hours. -Do not throw, drop or release any item from the tower. -No climbing on, leaning over or hanging from railings. -Do not touch the bells, equipment or cabling. -No running on stairs or observation decks. Walk at all times. -Individuals unable to walk the stairs are encouraged to use the elevator and remain on the Gallery Level Observation Deck. Please notify your tour guide if you are unable to climb the stairs. -Stay with your group at all times. -Children under the age of 18 will not be permitted on a tour without adult supervision. -No unathorized person is permitted in the tower when the bells are sounding/playing. -Facility is under video surveillance at all times. Please obey all posted signage. These rules are for your safety and the safety of others. Violators will be removed from the tower and subject to Naperville Park District Conduct Ordinance #641. WARNING: You will be climbing 253 stairs. Visitors are solely responsible for determining if they are physically fit for this strenuous activity. Visitors using the stairs do so at their own risk. Visitors may use the elevator and remain on the Gallery Level observation deck. Please notify your guide before the tour begins if you do not wish to climb the stairs. 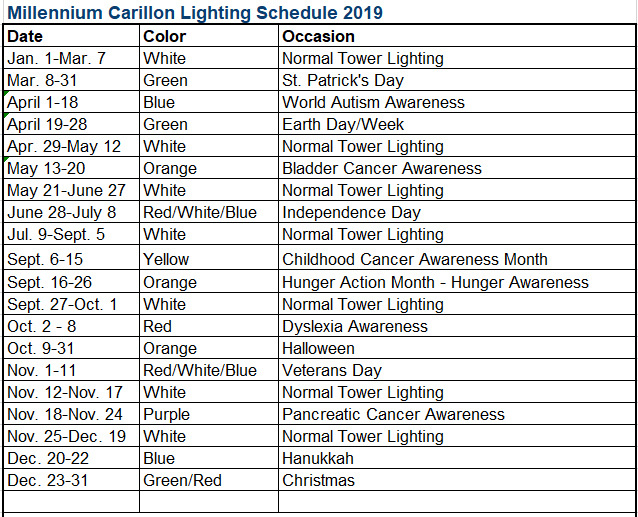 More information can be found at the Carillon website, www.naperville-carillon.org. Units of local government, school districts and colleges, not-for-profit corporations and public agencies are that are interested in proposing the display of certain colors to promote, celebrate, or commemorate non-profit or non-commercial community activities or events should contact the Park District at 630-848-5000.